“At this time, the cause of the outbreak is still unknown. We are going to our emergency broadcast system at midnight. and the millions of souls humanity has lost tonight. Mix “The Social Network” with “World War Z” and you get “Antisocial” as a result. A horde of computer minded people who are all addicted to a social network platform. And from one day to the other they start to unfriend everybody in the worst way. Is it a bad movie? No, not really. Is it an excellent movie? No, you can’t say that either. Is it worth it to sacrifice 90 minutes for this slasher / zombie / outbreak movie? If it’s your favorite genre, it’s definitely worth to have a look. So, where does the shoe pinch ? Firstly, you can’t say that the subject is very original. But it does use a different angle. You can compare it with the book “Cell” by Stephen King (I’m also reading that book,yes), in which modern society is disrupted by an electronic pulse that goes viral and gets people to use extreme violence. In “Cell” it’s the worldwide use of mobile phones that causes society to collapse. In “Anti Social” it’s the use of the so-called social network “The Social Redroom” (although it looks more like a dating site than for example Facebook), mainly by young people, that causes the mass hysteria. It may seem preachy saying that social networks are not too kosher, but actually this is in line with recently released movies. In those other movies they point at the danger of artificial intelligence (“The Machine“, “Transcendence“, “Her“) or show a society that’s turned back in time (“Dragon day“) by sending a virus via the mobile network. Second, they could have shown the overall mass hysteria in a better way. Not just by using some CNN-like news reports. The only other signs we witness is the banging of frenzy-behaving people on windows and doors. You don’t get the feeling this is global. You can only imagine it while looking at those news flashes and the chat sessions that one of the six students has with a good friend. The largest part is set in the barricaded house where the six companions try to survive and of course become a victim eventually. The most imaginative fragment is in the beginning where we witness the emerging frenzy. Two best friends put together a video for their blog about teen clothes they bought that day. At one time this goes horribly wrong and we witness what this condition results in. The way this was filmed is pretty crazy and chaotic. I suppose it was intended to visualize the state of mind of the insane. Thirdly, the acting isn’t that impressive. In retrospect one can conclude that this is as in most slasher films. The presentation of all the key players in the beginning using their profile from “The Social redroom” was extremely successful and original. There were some strong emotional moments that were played excellent. Like the moment everyone realizes that there are not many survivors in their circle of friends. And although they find out what causes all these problems, they stay connected all the time and they won’t let go of the constant communicating. Fourthly. Those who are waiting for the gore parts of this movie, must have an immense patience, as this rather takes a while before it kicks in. The final denouement and solution of the whole problem is completely explained. The healing process is even demonstrated by a surgeon live. For the fans, I can only say you can expect some exploding heads and a drill, which is needed eventually to solve the situation. Unfortunately, some interesting ideas were not developed further (dead people still remain connected to the World Wide Web). 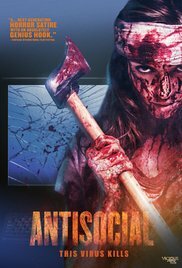 “Antisocial” is a typical slasher/zombie story with a fairly innovative subject. Only the elaboration is rather meager and looks unfinished. Despite being a low-budget film, it still manages to be an entertaining movie, infused with the satirical message about how our daily life is intertwined with the social media and what impact this might have on us. All things considered, it’s just an ordinary teen slasher film (and there are made zillion of this kind of movies) where they are picking numbers so to decide who’s next. It’s not the worst movie I’ve ever seen, but unfortunately they didn’t succeed in making this an spectacle that leaves a lasting impression.